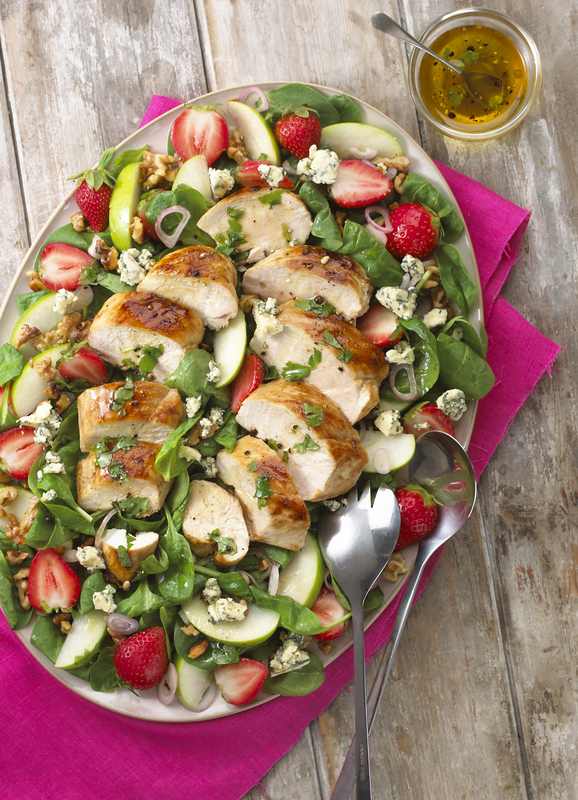 Grilled Chicken Strawberry Spinach Salad | Flavor Your Life. Season chicken breasts with salt and pepper, then place on the hot grill and cook about 4-5 minutes per side. Set chicken aside to rest. Whisk together vinaigrette ingredients in a small mixing bowl. Set aside. Add walnuts to a small dry skillet and toast over a low heat for several minutes until the walnuts are slightly toasted. Add spinach to a serving bowl, then top with shallots, apples, strawberries, walnuts, and blue cheese . Slice the grilled chicken breasts and place on top of the salad. Drizzle with the honey herb vinaigrette. To serve, divide onto 4 plates.